Vicki Carlisle, a young woman with ambitions that stretch far beyond the confines of her father's prosperous ranch in the high country of southern Wyoming, writes the adventures of her suffragette-like character Evangeline and has them published in Quest & Quill. When Evangeline tackles two age-old taboos, all hell breaks loose in her hometown of Feather Ridge. The simultaneous arrival of Will Harrison, a young Montana rancher who takes up the temporary post of foreman while Vicki's father recuperates from injury, complicates her less than simple life. In need of a new direction after his own personal tragedy, Will finds passionate Vicki, her five beguiling sisters, a busy ranch and becoming embroiled in the town's upheaval much more than he bargained for. - - - - - - - - - - - - - - - - Rippling with mystery and intrigue, The Storyteller will deposit you squarely in Feather Ridge, a little town with a big secret, and won't let you leave until the storyteller has spun her final web of words. - - - - - - - - - - - - - - - - "Vicki is a young woman who through the sheer exuberance of her imagination is prone to exaggeration. Will, being a steady young man who is realising that there is more to his life than what he's known, simply cannot resist her." 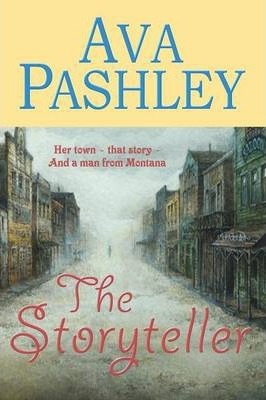 Ava Pashley on her romantic protagonists in The Storyteller.